Panasonic pitched the UB900 as a premium home entertainment device, looking to do everything from the one box. It's more potent and offers more audio options than the Samsung rival, but that's reflected in the £599 price. Where the UB900 isn't so good is in the interface: it's not the nicest to navigate, and streaming services feel a little like an after-thought. Taking a step into the future is Ultra HD Blu-ray, looking to up the quality and make the most out of the latest 4K televisions, all for your entertainment pleasure. There are currently two UHD Blu-ray players available. Vying to be the next big thing is the Samsung K8500, which we've reviewed previously, and the pricier Panasonic UB900. Separated by £170, the question right now for early 4K Blu-ray adopters is simple: should you pay the extra and pick-up the Panasonic player over the strong performance of the Samsung? 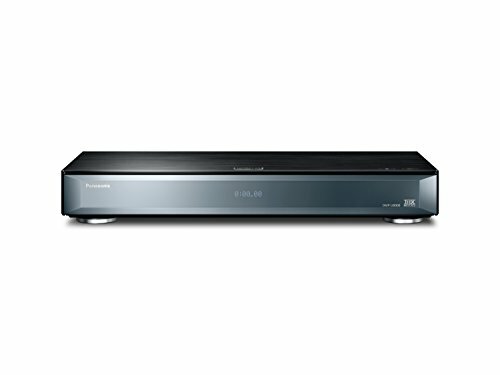 The Panasonic UB900 has a conventional design (unlike the curved Samsung), presenting a rectangular box that measures 435 x 68 x 207mm, including the four feet on the bottom. The top of the player has a dark-brushed, but glossy, finish - more like a piece of cabinet work than the flatter black finish of the Samsung player. As a result the Panasonic is better looking, but dust is more apparent given the gloss, plus that surface scratches easily and will need some care if it's on display. Like a number of Panasonic's previous AV devices, the disc drawer sits behind a hinged front - like a large flap - which spans the entire width of the player. To its centre is a translucent window to allow the on-player display be seen, presenting all sorts of available information. This display can be dimmed, or turned off - Panasonic goes as far as to suggest that it might downgrade the audio quality if you leave it on - but when connected to a television a lot of this information is available to view on the big screen, so in some ways this window and display could well be unnecessary. Also hiding under that front flap are two additional slots, one to support SD cards, the other USB, providing easy access if you want to play files from a digital camera or those downloaded from the internet. A full range of formats is supported, although where Samsung dealt with some Dolby Vision MPEG samples that we had, the Panasonic refused to play them. Neither player supports Dolby Vision, but Samsung will at least show the video (it just can't decode the HDR metadata). Most of the UB900's connection work is around the rear, as you'd expect. There's the Ethernet connection which we'd recommend using over the built-in Wi-Fi, especially if you plan on using any of the on-board streaming apps. There are two HDMI ports, designed to separate the video and the audio outputs, if needed. You will probably want to take the video direct to your television, but send the audio to a receiver or soundbar. Splitting them means avoiding any vagary over whether your UHD video is going to pass through to your other equipment unsullied. There's an optical connection too (completing the range offered by Samsung's player), but Panasonic has continued with connections offering digital coaxial, 2-channel analogue audio, and all the connections for a 7.1 system too. Straight from this box, therefore, the Panasonic player is the most adept with handling audio. Whether these connections are useful to you will depend very much on how you want to set things up though. It gives you choices, but we suspect that many will take the audio from the HDMI and be done with it (if you're passing to an AV receiver that you already own then you won't look at the 7.1 ports). But this is being lined up as an audiophile player, with a 192kHz/32-bit DAC, offering high-resolution audio, as well as carrying Ultra HD Premium and THX certification. The player itself supports a number of configurations, so if you want to use different devices for different types of audio then you can, or if you want to output to a 4K TV and a projector (not simultaneously) you could, all from the one player. There are various restraints if you want to do this, and you'd have to master the settings menu, but it's there for those (the few?) who might want to do so. Setup of the Panasonic DMP-UB900 is fairly straight forward - although the first player we received was broken and had to be swapped for a second sample. Aside from plugging in those physical connections and the Ethernet line into the back, there's isn't a huge amount to do to get started. In many cases you'll find that "automatic" settings cover most of the conventional requirements for playback, so you don't need to do anything out of the box. The critical thing to do is ensure that the 4K TV to which you're connecting the UB900 player has the HDMI Deep Colour/UHD Color turned on for that HDMI connection. Currently this doesn't happen by default, but once you've manually switched it on in your TV settings, you should be all set. At present this applies to all Ultra HD devices, not just this player. There are settings to govern the output around all those different connection options, as well as to manage other video settings, like 24p. Setting this to automatic will override the default 50/60p settings, but there are options to turn things off if you have a preference. If you're not sure what is coming out of your UB900, there's a handy "playback info" button on the remote. This will detail the source and your video and audio connections. If there's anything wrong with the settings (on TV or player), you'll probably spot it here, such as if you're only getting a 1080p picture on your 4K TV. This information also includes whether it's HDR (high dynamic range); the Samsung TV we connected to also indicates an HDR device is connected, which helps you know you're looking at the right thing. There are minor hiccups though: when connected to a Samsung TV we received the message that the player was not connected to a 4K Ultra HD TV, but on playback both devices report the correct settings. The same thing happens when connected to a 4K SDR LG TV. The UB900 comes with a substantial remote, the polar opposite of the slender minimalism of the Samsung's. That gives you universal remote options, like TV controls, as well as a whole range of playback and settings controls. There's a Netflix button to go straight to that service and an "internet" button that opens the on-board apps, as well as individual buttons for a range of other extras. This includes things like high clarity audio and sound effects, the former designed to remove everything that might have an impact on sound quality - including video and the player's display - and the latter to provide a range of effects, like night surround, remastering, or "digital tube sound" (settings that might be a little lost on some, especially if you're just looking to output the audio direct to an existing system with its own selection of audio settings). The UB900's user interface (UI) isn't especially graphical, but it is richly delivered, breaking down into video, music, photos, home network, network services and setup. The Panasonic player feels a little dated in this regard, reminding us of a media player first, rather than a smart device embracing the future. As we always say with these devices, there's a chance you've already got a smart TV, so you might not want to use your UB900 for anything other than playing Ultra HD Blu-ray, in which case the slightly dated UI might not matter, but it is rather slow at times. Hit the remote button for "home" and it takes a while to get there, hit the "internet" button and it's a lengthy delay before you arrive at the apps menu. Having reviewed the Samsung alternative, we knew what to expect from the picture quality on the UB900 and we weren't disappointed. Panasonic has put a lot of time and effort into positioning this player as the premium model (indeed it is Ultra HD Premium badged, but then so is the Samsung player (now, anyway, it wasn't when announced). READ: What is Ultra HD Premium and why does it matter? The player is perhaps a little slow to get going - although that's no different from the Samsung - and the disc-accessing noises when starting a new film are a little noisier than we'd like. Still, the picture performance is very good indeed, delivering wonderful quality. When compared to the Samsung, we get the impression that Panasonic is pushing a little harder: the HDR effects seem a little more dramatic and the colours a little richer. We'd say that was true of watching The Martian, with richer reds and more piercing pricks of light for the stars, for example, and that matches Panasonic's push towards a high-end enthusiast player in the UB900. There's certainly a more geeky feel to the Panasonic player: hitting that info button we mentioned will report that it's HDR BT.2020 colour and so on, and that at least provides instant confirmation of what you're looking at and hearing, which is true of DVD and Blu-ray discs too. Ultra HD Blu-ray is delivered with wonderful detail. We've spent plenty of time sitting marvelling at it, but resolution is only half of the Ultra HD Blu-ray story: HDR (high dynamic range), which we've mentioned a number of times already in this review, is the part that really makes the biggest difference. HDR brings dynamic range that you didn't get with Blu-ray, delivering a wider gamut of white-through-black, with detail that is non-existent in standard range, and that makes a bigger difference than just bumping up the detail. READ: What is HDR, what TVs support it and what HDR content is available? If you don't have an HDR TV, this is what you really miss out on, as although Ultra HD Blu-ray is packed with detail, it's really the HDR that brings the excitement. Connect to a lower-spec 4K TV without HDR and that's no problem, you'll still get the detail and playback is very good, but it lacks that extra dynamic range that elevates Ultra HD Blu-ray to an exciting premium level. Upscaling is handled very well, with Blu-ray still looking wonderfully sharp. With the release of Ultra HD movies taking some time, you'll be watching plenty of your existing discs through this player, and happily they look very good indeed. DVD is also perfectly watchable: the difference between DVD and Ultra HD Blu-ray is staggering, the difference between regular Blu-ray and Ultra HD Blu-ray slightly less so. We've mentioned Netflix already and with Amazon Video also offered, the UB900 can be your one-stop shop for 4K content. The streaming performance is good, although in some ways it feels a little secondary compared to the disc-spinning skills of the player. But let's not ignore that Amazon and Netflix probably carry more Ultra HD content than you have on physical media right now (and for less money). Currently there's no support for HDR on Netflix, but that will change. When it comes to streaming you don't get the same on-screen info button that you get for optical discs which is a shame. The Samsung rival at least gives you an info button that will show you what quality you're streaming for Netflix, which is a handy addition if you suspect your broadband isn't up to the challenge. The "internet" or "network services" menu is horrible, though, again showing some questionable UI decisions. There's a grid of nine icons, one given over for an advert and every move is confirmed with a shrill beep. Once you're in the player itself you're back in the safe environment of that player's standard layout, but getting there is a little gut wrenching. The Panasonic DMP-UB900 is pitched towards the high-end and it has all the performance to support it, offering high quality audio and stunning visuals. There's wider appeal for those wanting greater audio options, too, offering more options than the current rival from Samsung - although most will just utilise the dual HDMI output option available on both players. However, the Panasonic's user interface does feel a little cold and although it offers a full range streaming services, it's more effort than it should be to get to them. In that sense, the rival Samsung player perhaps has greater out-of-the-box consumer appeal. Then there's price. At £599 the Panasonic couldn't be called budget. But for that money the UB900 is well built, looks great and comes with a substantial remote. For enthusiasts who want the best, with the most audio options direct from the player, the Panasonic player offers slightly superior performance. For those who want a more affordable in point, the temptation to save £170 for the slightly simpler approach of Samsung can't be ignored... that equates to eight Ultra-HD Blu-ray movies, after all.